Actor and playwright Simon McBurney probably did not anticipate the explosion of old-fashioned radio theater that's been happening lately via podcasts when he began working on The Encounter several years back. Like many of the pieces he's worked on with Complicité, the 34-year-old London theater collective that he co-founded, the piece relies heavily on technology — in this case, a binaural microphone developed by German manufacturer Neumann that looks like a human head and that mimics the way we hear sound locationally around our heads. The marvelous effect, created with the help of sound designer Gareth Fry and individual headphones for every audience member, is an immersive piece of sound theater that arguably could presage the future of podcasting or just audio experiences generally. McBurney has applied the technology to an adaptation of a 1991 novel called Amazon Beaming by Petru Popescu, which is based on the real-life experiences of American National Geographic photographer Loren McIntyre traveling through the Amazon rainforest by himself and becoming embedded, as it were, with the Mayoruna tribe in 1969. McBurney's piece, in which he alternately portrays himself, as well as an omniscient narrator, and McIntyre, manages to tell McIntyre's story while simultaneously describing the struggle of interpreting it for the theater, and dipping us into the mind of McBurney as well. "I have a very hard time stilling my mind," McBurney admits in an interview with Curran editor at large Kevin Sessums, showing him a mark on his head where he, without realizing it, had dug in the claws of a hammer during rehearsal. And that intensity comes through multiple times in The Encounter, in which the line between McIntyre's own revelations during his jungle stay in 1969 blur completely into McBurney's in the present day, and what results is a piece of theater that is as much about existence and the passage of time as it is about materialism, nature, and the scourge of capitalism that is destroying the Amazon bit by bit. At the outset, McBurney tries to play off the problematic nature, especially in today's academic discourse, of McIntyre's white-man's experience of an native tribe and their customs. That is not what we're here to parse. Instead, McBurney wants us to focus on the visceral power of being stripped of civilization, and possessions, and of wandering a completely strange and threatening environment with nothing but the kindness of other human beings to rely on. It may have been a more interesting piece, overall, if McBurney had tried to speak to some of the questions of how McIntyre got himself into the predicament of being stranded and taken in by natives when he was there to document and photograph them. But he made an effort to connect himself to the story by traveling to the Amazon himself several years ago, something he documented in video, and he finishes his curtain call by saying that one of the modern-day Mayoruna whom he met insisted that he return to tell his people that "we exist," i.e. to remind all of us in the developed world that there are people who still live close to nature and who are trying to protect precious parts of our environment from human development and climate change. In that way, he implies, his project is similar to McIntyre's — one of bringing back the evidence of lives, and this other way of life, to the rest of us who may not remember that they're there. 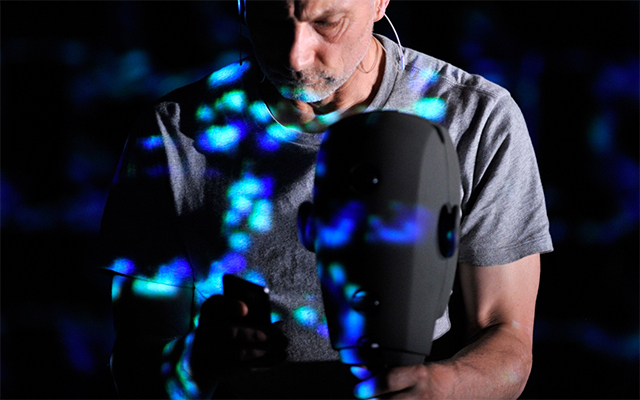 The Encounter is at its best when, running around the stage, McBurney is creating a mental landscape for us purely through audio acrobatics, old-timey radio effects like sloshing water bottles and rustling celluloid tape, and his own evocative talents of description. Also, we are constantly pulled back out of this immersive story by the interruption of McBurney's young daughter, invisible but heard as if she were right in front of us, wandering into his studio as he works on the piece when she's supposed to be in bed. We're expected to make those leaps in time and space with ease, and mostly we do. Gorgeous visuals by lighting designer Paul Anderson and projection artist Will Duke, utilizing the large, beautifully textured upstage wall of audio foam, provide something to look at in moments when McBurney is more vocal artist than spectacle. Fans of experimental theater should experience the piece, if for no other reason than it feels fresh and powerful in its form alone. The collective experience of the theater is changed, but only slightly, through the use of the headphones. It's the world of effects, and the strangely dizzying, discomfiting sensations that the technology brings — I promise you you will feel itchy and anxious within the first five seconds of hearing a mosquito — that are the single biggest success here. It's exciting enough just to realize that technology has provided this angle on the medium of theater, and it's a far more stirring version of virtual reality than the visual VR realm has shown us so far. The Encounter plays through May 7. Find tickets here.